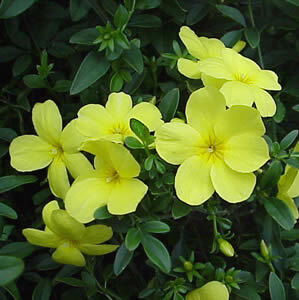 Primrose Jasmine is a tall, slender stemmed evergreen shrub. It has dark green leaves and a square stem. The flowers are lemon-yellow and unscented these are normally seen in the winter and spring. Sometimes Primrose Jasmine acts like a climber with it wild branches and it can grow up to 10 feet tall when planted near a support. Jasminum mesnyi can grow in shade but looks best in a sunny location with a well drained soil. Looks best when given adequate space, as it can get 2-3 times as wide as it is tall. This plant is a vigorous grower and may need to be sheared occasionally to keep it from getting out of control. Primrose Jasmine is a great plant for a cascading effect in the landscape.